Apple earlier this month completed an acquisition of Metaio, a German augmented reality firm that first started life as a side project at Volkswagen, for an as-yet-unknown project. The buy was uncovered on Thursday by TechCrunch, which pointed to a Twitter post showing a legal document seemingly confirming a full transfer of shares from Metaio's holdings to Apple. Metaio recently canceled its user conference originally set for June, disabled its Twitter accounts and just days ago posted a notice announcing an end to product and subscription sales. When reached for comment, Apple offered its usual statement of confirmation, saying, "Apple buys smaller technology companies from time to time, and we generally do not discuss our purpose or plans." According to Metaio's website, the company specializes in augmented reality and computer vision solutions. One tool, called Metaio Creator, helped customers author immersive, interactive experiences using existing devices like Apple's iPad. 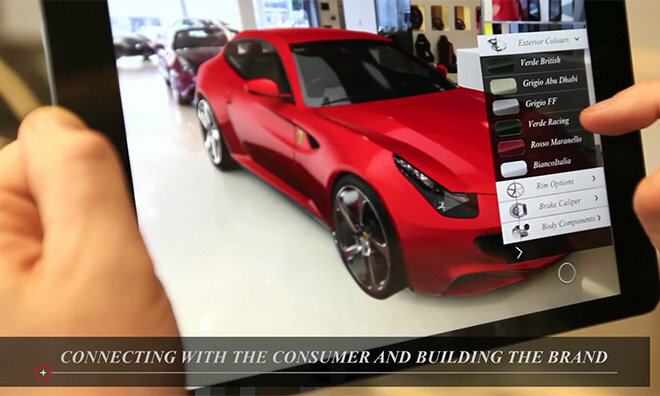 As seen below, an app from Ferrari allows prospective buyers to use a tablet and view a car's trim level overlaid on the actual model. Apple's plans for Metaio and its staff remain unclear, but Cupertino has been researching augmented reality hardware and software for some time. It was reported in March that Apple already had a team dedicated to exploring potential AR deployments. In addition to ongoing in-house research and development, Apple holds a variety of patents covering gamut of augmented reality applications, including transparent displays, mapping solutions and iPhone-powered virtual displays.